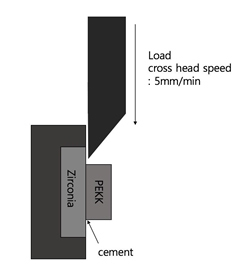 Aboushelib, MN, (2011), Evaluation of zirconia/resin bond strength and interface quality using a new technique, J Adhes Dent, 13, p255-260. Breeding, LC, Dixon, DL, Bogacki, MT, Tietge, JD, (1992), Use of luting agents with an implant system Part I, J Prosthet Dent, 68, p737-741. Cho, jh, Jeong, CM, Jeon, YC, Effect of various cement and thermocycling of retentive strengths of cemented implant-supporte. prostheses, (2003), J Korean Acad Prosthodont, 41, p482-491. Clayton, GH, Driscoll, CF, Hondrum, SO, (1997), The effect of luting agents on the retention and marginal adaptation of the CeraOne implant system, Int J Oral Maxillofac implant, 12, p660-665. Fwlton, DA, Kanoy, BE, White, JT, (1987), Recemention of dental casting with zinc phosphate cement: effect on cement bond strength, J Prosthet Dent, 58, p579-583. Henry, PJ, Laney, WR, Jemt, T, Harris, D, Krogh, PH, Polizzi, G, (1996), Osseointegrated implants for single-tooth replacement; A prospective 5-year multi-center study, Int J Oral Maxillofac implant, 11, p450-455. Ohl, A, Schroder, K, Keller, D, Meyer-Plath, A, Bienert, H, Husen, B, (1999), Chemical micropatterning of polymeric cell culture substrates using low-pressure hydrogen gas discharge plasmas, J Mater Sci Mater Med, 10, p747-54. Patrick, R, Schmidlin, Bogna Stawarczyk, Marco Wieland, Thomas Attin, Christoph, HF, (2010), H￤mmerle, Jens Fischer, Effect of different surface pre-treatments and luting materials on shear bond strength to PEEK, dental materials, 26, p553-559. Schwitalla, A, Muller, WD, PEKK dental implants: a review of th. literature, (2013), J Oral Implantol, 39, p743-749. Seo, KS, Kwon, TY, Kwon, YH, Kim, KH, (2003), The Comparison of the Tensile Bond Strengths of Provisional Luting Cements in Implant-Supported Crowns, Kor J Dent Mater, 30, p395-402. Shin, HK, Song, YG, Shin, SY, The Effect of Temporary Cement Cleaning Methods on the Retentive Strength of Cementation Type Implan. Prostheses, (2011), J Dent Rehab App Sci, 27, p125-140. Skinner, HB, Composite technology for totalhi. arthroplasty, (1988), Clin Orthop Relat Res, 235, p224-236. 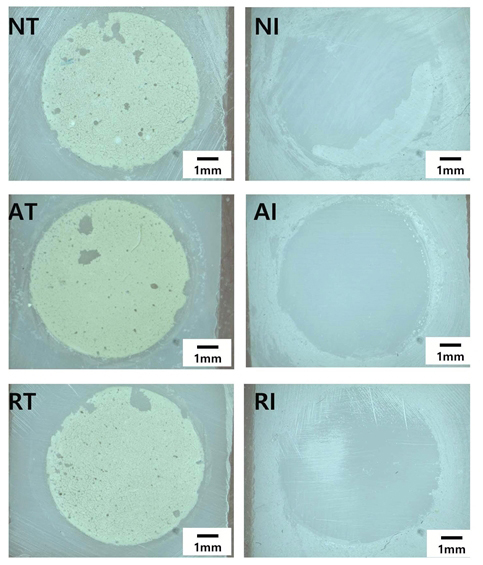 Zhou, L, Qian, Y, Zhu, Y, Liu, H, Gan, K, Guo, J, (2014), The effect of different surface treatments on the bond strength of PEEK composite materials, Dental Materials, 8, pe209-e215.